Welcome to The Abso!ute Sound online! We explore music and the reproduction of music in the home. We believe that the sound of music, unamplified, occurring in a real space is a philosophic absolute against which we may judge the performance of devices designed to reproduce music. Our goal is to provide the resources consumers need to judge how a component's sound either honors or departs from the music's truth, and to make sound purchasing decisions that maximize their experience of reproduced sound. Below is our Issue 212, April 2011 table of contents and link to the editorial. 16 Book Review: Vinyl Lives! Wayne Garcia on this new guide to the best vinyl shops in the U.S.
We take you behind the scenes of the planet's biggest audio show with 29 pages of exclusive coverage. This tall floorstanding loudspeaker with powered side-firing woofers delivers a big sound from an ultra-slim package, says Kirk Midtskog. There's nothing "dark" about this star of a turntable from Germany, according to Neil Gader. 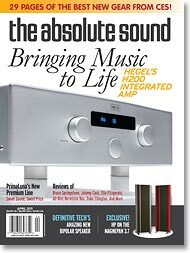 Neil Gader on this upscale new line from the guys who put the fun-and value-back in tube audio. These mini, but mighty powered-speakers from the "pro" world are ideal for a wide range of applications. Steven Stone reports. Neil Gader listens to this unusual high-sensitivity, virtual single-driver loudspeaker. 20-year-old Norwegian high-end company Hegel showcases its unique amplifier circuits in this mid-priced integrated. Kirk Midtskog has the good news. Anthony H. Cordesman evaluates a pair of über-expensive tubed components from Germany's Octave Audio. 110 HP's Workshop: In a world scoop, HP weighs in on the most anticipated loudspeaker of the year-the Magnepan 3.7. Andy Quint visits Zenph Sound Innovations and reports on the company's séance-like materializations of pianists Rachmaninoff, Glenn Gould, Art Tatum, and Oscar Peterson, summoned up from the past in state-of-the-art sonics. New releases from Iron and Wine, The Walkmen, Gregg Allman, and Jim Byrnes; seminal recordings by Bruce Springsteen, Johnny Cash, and The Stooges rescued from the vaults; and MoFi's vinyl reissue of a Ray Charles classic. Recent offerings from Jim Hall and Joey Baron, Gyan Riley, and the Dave Liebman Group, along with vinyl remasterings of Ella Fitzgerald and Duke Ellington at the Cote D'Azur, and Bill Evans at Town Hall. Janácek string quartets and ancient Armenian hymns with a twist, Castelnuovo-Tedesco overtures, tangos on piano, and a bargain-priced 60-disc anthology of symphonies conducted by Leonard Bernstein. Mark Lehman initiates a new TAS feature with five "personal favorite" Sixties jazz instrumentals. Hans Ole Vitus of Vitus Audio talks with Neil Gader.